Maximum 30 characters. Maximum 2 lines. A full design proof will be provided for you approval, prior to production. Asset labels and stickers. 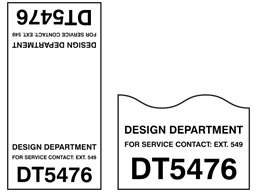 Part of our Asset and numbered label range.Assetmark cable wrap label with two lines of custom text (upto 30 characters per line), and consecutive serial number sequence. Material self adhesive polypropylene, with laminated surface. Supplied in rolls of 500 labels. Black print on white background. Serial number labels. Assetmark cable wrap. Consecutive serial number with two lines of custom text (upto 30 characters per line). BSW02 Size 100mm x 50mm. Material self adhesive polypropylene, with clear laminate.